Timberline Radio Systems Ltd. has been in the business of building, designing and engineering Portable Solar Powered Radio Repeaters since 1999. We supply commercial grade, fixed station and portable Solar Powered Repeaters for VHF Land Mobile, VHF Marine & Aviation. Our repeaters are designed for low current, solar powered applications primarily at base station & mountain-top sites. A great product for Mining, Marine, and Oil Exploration where reliable, low current, long range communications is key. 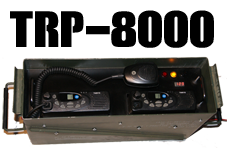 Most recently, we introduced our newest Transportable Repeater, a Complete Repeater Solution, built inside a Weatherproof, US Military 40mm AMMO BOX. Configurations include COS & Controller operation with an option for a third transceiver to be used in UHF uplink mode. The case includes an AC to DC Power Supply, power Switch, Mobile Comprod Duplexer, UHF Uplink module, DC Outlets for Battery & Solar as well as an External Antenna outlet with "N" Type connection. Componants explained:All external componants use military grade connectors (MIL-SPEC) with type approved waterproof dust-caps. The main components of each Repeater are constructed using genuine TAIT Transceivers along with Sinclair Duplexers, designed to suit each individual application. Additional components include an external 100 Ah battery, Solar panels and Solar Regulator built inside a Pelican case for portability and use in extreme elements. Portable repeaters are used for road building, forestry work, mining, hydro electric, search and anywhere that requires extended radio range.